When it comes to debates, voters across the political spectrum are generally united in their disapproval of what goes on when candidates gather together in front of a live audience and TV cameras to confront each other and the issues of the day. “Why don’t they actually engage with each other,” is a distillation of the common complaint one hears by those who watch candidate after candidate pay lip service to a question that’s been asked or a challenge given, and then launch into talking points or deliver snappy one-liners that were obviously prepared well in advance. On an important level, this frustration is a healthy one since it indicates public preference for genuine argument, vs. the type of faux dialog we see during most televised debates (a style that has seeped into other uncontrolled campaign activities, such as interviews and press conferences). This preference should not be seen simply as romantic longing for the lofty oratory you’d expect in Cicero vs. Caesar or Lincoln vs. Douglas match ups. For voters frustrated with the artificiality of modern public debate also demonstrates understanding that the real thing is far more entertaining than the fake one. In defense of today’s political aspirants, however, you need to keep in mind that when leaders gave political speeches or took on rivals in earlier times, they were playing for a very different kind of audience than are today’s presidential hopefuls. Ancient Athens, where modern rhetoric was born, was a city-state with probably no more than 100,000 voting citizens (just three times larger than the Boston suburb where I now live). And from then through most of the modern era, political speeches were given in front of small numbers of intimates, most of whom knew (or were related) to the speaker and thus had much personal information about a political candidate before that candidate opened his mouth. In today’s much larger and more fragmented world, our understanding of a candidate is actually a composite made up of pieces of information we get from media, some of it compromised by the campaigns or by media sources determined to frame this or that candidate in a particular positive or negative way. And even in an era when less distorted information is available via the Internet, few of us have the skills (or inclination) to build profiles of those we will vote or not vote for in an unbiased manner. Given this reality, it is perfectly rational for a candidate to try to avoid risk associated with engaging their opponents on stage or do anything else that might throw a monkey wrench into a carefully prepared strategy based on trying to get identified subsets of voters to generate positive composite profiles of themselves and negative ones of their rivals. Which means that our attempt to judge today’s debates against earlier standards of rhetoric might represent a Category Error, that is a fallacy based on assuming two different things (such as historic personal debates and modern televised ones) are members of the same category when they might not be. All that said, the ability to avoid debate while pretending to participate in it is a skill not all candidates have mastered. When former presidential hopeful Mario Rubio was dinged for endlessly repeating himself by his Republican rivals, for instance, his rhetorical “crime” was clumsy integration of predetermined talking points into his speeches, which made his attempt to control an argument too obvious. 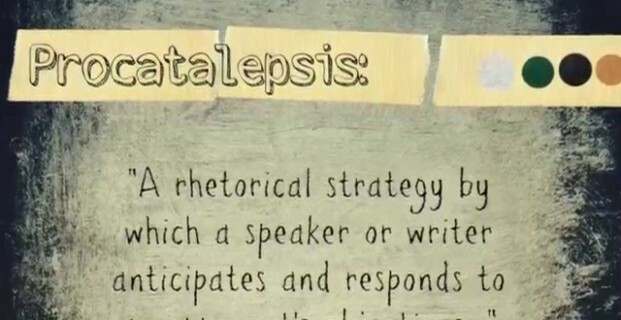 Classical rhetoric does offer some pointers to those who want to ensure debate occurs on their own terms, including a device I mention in Critical Voter called procatalepsis which involves introducing a criticism you know is coming, but casting the issues in terms favorable to your position. It’s probably too late to get candidates with a head of steam to start using rhetorical devices that still allow them to control debate while actually taking on the substantial issues they are supposed to be engaging with. But perhaps it is not too late for the rest of us to do so.